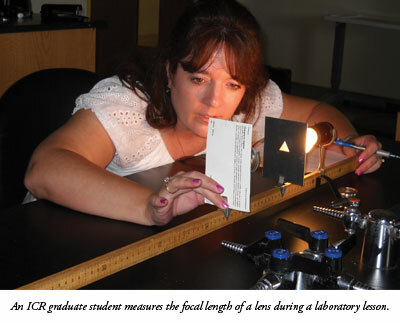 The Institute for Creation Research Graduate School (ICRGS), which is based in California, has offered degree programs since 1981 with the aim of expanding the impact of creation science studies and providing students a rigorous exposure to the hard sciences from an unwavering creationist perspective. This year, ICRGS is proud to confer M.S. in Science Education degrees on five students, with minors in biology, astro/geophysics, or general science, and M.S. in Geology degrees on two students. The graduates will celebrate their accomplishments this month in a student-organized event in Concordia, California, near San Francisco. Attending the celebration will be Chair of the Science Education Department Dr. Patricia Nason, Professor of Geology and Chair of the Geology Department Dr. Steve Austin, Adjunct Professor of Biology Dr. Chris Osborne, and ICRGS Admissions Secretary Mary Smith. Completion of the comprehensive Science Education program is certainly a feat worth celebrating, says Dr. Nason. "They worked hard," she said. "It's a time to celebrate, and they've earned it. It's a turning point in their lives where they desired to learn something, and now they have and they're going to move on." The graduates will have the opportunity to present the finished products from their SE 505 class, Implementing and Assessing Science Teaching. The course is designed to assess the effectiveness of an individual in a classroom setting and includes a self-critique of videotaped instruction. The students, most of whom are teachers already, were also required to create effective lesson plans. "SE505 is a capstone course, the last course they take," Dr. Nason explained. "At the end of it, they turn in their lesson plans and their videotapes of themselves and their self critiques. They also have their own students evaluate their teaching. And they have to do an assessment to see if their students learned what they had taught them." ICRGS is not simply about instructing individuals to teach students to "parrot back" information, she added. The graduate program was designed to teach teachers to help students learn how to think, which is more important than simply what to think. Dr. Nason told a story about when she lived in North Carolina and looked into buying some property. It was a beautiful piece of land, she said, but it was located inside another owner's property and had no access roads to it. "Our brains are the same way," she said. "It's one thing to fill a student's head with information, but if there aren't any access pathways or connections to that information, it isn't useful." The job of the ICRGS graduates is now to help students under their guidance make those connections, or "construct knowledge." When those students then are confronted with atheistic and evolutionary interpretations of science, they are equipped to work through the questions involved from a biblical creation perspective and defend their faith. "God doesn't need defending," Dr. Nason said. "But we live in a world where others try to negate the truth of creation." What the graduates learned at ICRGS, she said, can then be passed on to their own students. "This is knowledge that will last not just for a moment, but for a lifetime." The celebration is slated for July 10. Cite this article: Dao, C. 2010. ICR Graduates--A Cause for Celebration. Acts & Facts. 39 (7): 19.